Immunohistochemical and cytometric analysis of VH4-34+ antibody expression. (A) Cytometric analysis to determine the percentage of naive (24 donors), IgM+ GC (2 donors), IgM+ memory (Mem) cells (11 donors), IgG+ memory cells (12 donors), and Cδ-CS GC cells (14 donors) utilizing VH4-34 (mAb 9G4+). Bars indicate mean. (B) Detection of VH4-34–encoded antibodies by 9G4 is inhibited by somatic hypermutation. Relative binding by 9G4 was compared by ELISA for an unmutated VH4-34–encoded antibody (FS7) plus six VH4-34–encoded heavy chains harboring somatic mutations and a non–VH4-34 control antibody (VH4-39). Dashes adjacent to the clone names indicate mutations to the 9G4 mAb epitope at amino acids W7, A23, V24, and Y25, and replacements are indicated by single-digit amino acid code. The mean and SD of three assays are indicated. (C) Micrograph of a human tonsil section stained with anti-IgM (red), anti-IgG (blue), and anti-VH4-34 (9G4 mAb, green). The field is bisected by a follicular mantle (naive B cells) surrounding a GC at the bottom. Individual naive cells were scored for frequency of VH4-34 usage from 4 donors (7% ± 1% SD were VH4-34+). (D) Micrograph of a tonsil section stained with 9G4 mAb (anti–VH4-34, green). Two GCs are evident from the mantles of 9G4+ stained naive cells. 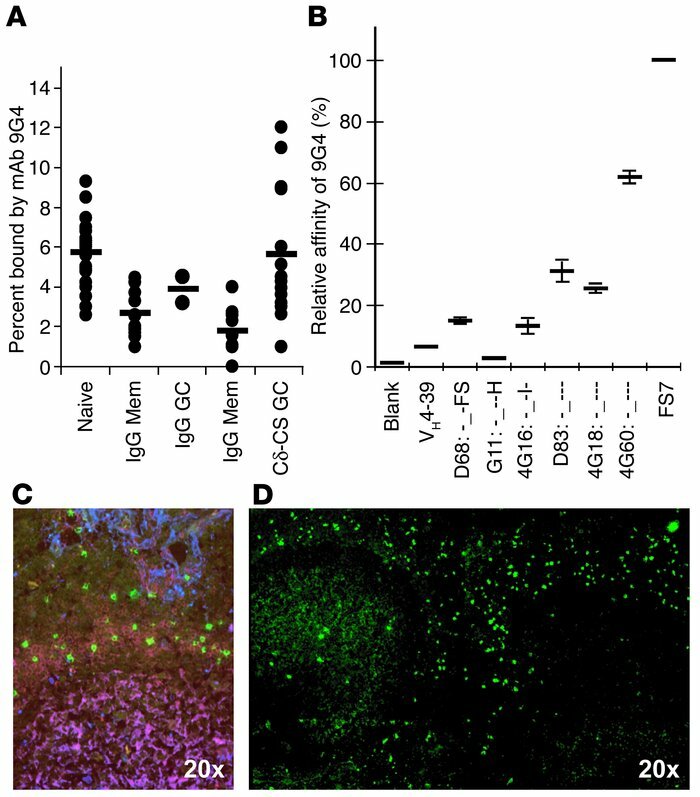 The GC on the left is made up of an oligoclonal expansion of VH4-34-utilizing (9G4+) cells with 9G4bright plasmablasts differentiating within the GC proper, indicating that VH4-34+ B cells can contribute to immune reactions. The GC on the right is 9G4–.